Foreign Affairs Minister Chrystia Freeland speaks after receiving the Foreign Policy’s Diplomat of the Year Award in Washington, on June 13, 2018. 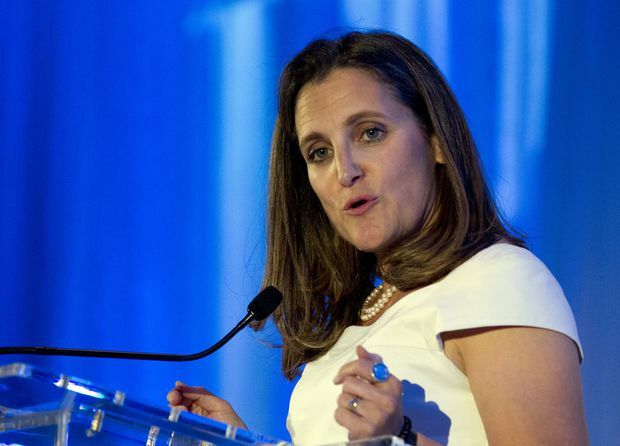 Chrystia Freeland is warning that President Donald Trump’s tariffs on Canadian steel and aluminum are part of an international assault on the global order the U.S. itself has led since the end of the Second World War. In a passionate speech to a Foreign Policy dinner Wednesday, where she received the magazine’s diplomat of the year award, the Foreign Affairs Minister predicted that the U.S. will face its own decline as a great power if it does not turn away from the nationalistic populism currently running the White House. The speech came in the middle of a two-day trip to Washington in which Ms. Freeland is meeting with opponents of the tariffs in the U.S. Congress and trying to restart stalled NAFTA talks. It also comes less than a week after bilateral relations reached unprecedented tension as Mr. Trump and his advisers tore into Prime Minister Justin Trudeau in personal terms. Ms. Freeland avoided mentioning the President by name in her speech, but repeatedly took aim at his ideology and tactics. She cautioned that economically hurting communities are “vulnerable to the demagogue who scapegoats” immigrants. And she appeared to reference both Russia’s attempts to tip the U.S.’s 2016 presidential election with false news stories spread on social media, and the penchant of politicians to bend and distort the truth. “Facts matter. Truth matters. Competency and honesty, among elected leaders and in our public service, matter,” she said. Ms. Freeland is the seventh person and first Canadian to win Foreign Policy’s award. Previous winners include then-U.S. secretary of state John Kerry, Paris Mayor and climate change crusader Anne Hidalgo, and International Monetary Fund president Christine Lagarde. Foreign Policy’s editor-in-chief, Jonathan Tepperman, said the magazine chose Ms. Freeland both for her handling of the NAFTA talks and fraught relationship with Mr. Trump, and for her ability to articulate a defence of a rules-based international system. “It was her bravery and her eloquence in articulating a liberal international vision, and her adroitness in managing this very difficult diplomatic dance with Washington that really made her stand out this year, when conventional diplomacy has taken such a hit and become so much more spectacularly complicated than in any year in living memory,” he told The Globe and Mail. Indeed, Ms. Freeland’s speech was given over to warning about the growing threat to globalization from nationalists, Nazis and authoritarians. These forces are thriving, she said, because the “middle class is hollowed out” and income inequality is rising. The solution, she said, is to strengthen national social safety nets and bring in more robust labour standards to give people economic hope and keep them in the camp of democracy. Far from the permanent victory for democracy the end of the Cold War was supposed to represent, Ms. Freeland said, the world now finds itself in a battle to preserve freedom and the international rule of law.